It is Thumbs up grip for Leica M (type 240, 246, 262 & etc. ).You can feel more comfortable feeling about grip by this item. Thumbs Up EP-10S has a ergonomic profile. 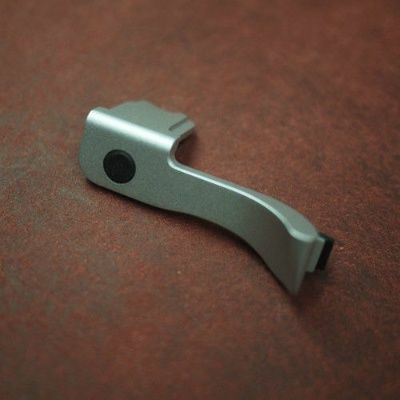 The thumb rest is angled at 22 degrees, and this shape distributes the pressure from your thumb more uniformly. This refinement allows you to hold your camera extremely rigidly, yet with great comfort. Thumbs Up EP-10S is CNC machined from solid brass billet, and the Cold Shoe is an integral part of the complete assembly and cannot be removed – no screws, no joints and no glue, all ensure strength and longevity, and guarantee that holding your camera for your compositions can be done in a repeatable way every time. A silicon rubber insert that extends across the full width of the back of the Thumbs Up, provides a cushion between the camera body and your Thumbs Up EP-10S. This silicone rubber insert also serves to dampen camera vibration between your hand and the camera. Our Classic Thumbs Up EP-10S, machined from solid brass is hand finished and painted in our Safari green to match the gorgeous Leica M-P Safari special edition camera.